The smallest out of all the Sandals resorts, Sandals Carlyle is considered a small boutique hotel with some characteristics of a bed & breakfast. Many come away saying Sandals Carlyle felt like home as they enjoy the "larger than life service" and dedicated personalized welcome. This should be no surprise as Sandals Carlyle takes pride in having one of the best and most attentive staffs among the Sandals brand. 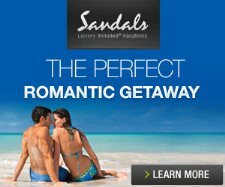 Sandals Carlyle offers the lowest and most attractive rates among the Sandals resorts. In addition, as an additional perk unique to Sandals Carlyle, all room categories include 24-hour room service. Location - Sandals Carlyle is located at the end of Montego Bay's "Hip Strip" which features shops, small hotels, restaurants, and the historic Doctor Cave's Beach. At one time before today's larger resorts were constructed, the Hip Strip served as a primary tourist destination. Sandals Carlyle is about a 10 minute drive from the Montego Bay airport. Atmosphere - Guests who come to Sandals Carlyle are seeking a smaller intimate quieter environment which features excellent dining and a friendly staff, all at very attractive rates. The resort is particularly popular with European travelers. Layout & Design - Sandals Carlyle is a one 3-story building with a pool, three restaurants, garden area, tennis courts, and a small amphitheater. The hotel does not have its own beach, but the public beach across the street is generally safe to use although you will be approached by the local merchants. While the resort has fewer facilities, many guests take advantage of the exchange privileges and complimentary shuttle to the other two Montego Bay resorts to enjoy the beaches, water sports, dining, and entertainment. Sandals Carlyle has 3 restaurants. Room Service included for the Butler Service room (24-hour) and all other room categories (7:30am-10pm). All restaurants are non-smoking. Bay Window (International) Sample Menu - The resort's primary restaurant serving a la carte dining indoors or poolside under the stars. Breakfast 7:30am-10:30am, lunch 12:30-2:30pm, dinner 6:30-9:30pm resort casual attire, no reservations required. Carlyle Restaurant (French) - featuring exotic french cuisine. Reservations required, resort evening attire. Dinner 6:45-9:30pm. Nibbles (Garden Grill) Sample Menu - Favorite lunch and snacks throughout the afternoon and late evening hours. Casual attire, no reservations, daily 11am-6pm & 10pm-1am. Nightly entertainment includes resident band with cabaret singers, karaoke, and pianist. Sandals Carlyle has one pool, whirlpool, and access to public beach. Air-conditioned fitness center and small resort spa. Land sports include volleyball, day/night tennis, basketball, shuffle board, board games, and billiards. Full Red Lane Spa & Watersports including scuba and snorkeling are available at nearby Sandals Montego Bay and Sandals Royal Caribbean with complimentary shuttle transfers. 52 rooms among 4 categories. Complimentary 24-hour room service for all categories. Butler service category includes complimentary in-room stocked mini bar and Wi-fi. All rooms with four poster mahogany king bed, refrigerator stocked with water, soda, and juices. The accommodation building is 3-floors with internal hallways, no elevator. (CP) Carlyle Oceanview Penthouse Butler Petite Suite - balcony with best ocean views, tiled flooring, and butler service. 3rd floor. (GO) Carlyle Oceanview Grande Luxe - large room with oceanview balcony, 2nd floor. (PR) Carlyle Premium - room with balcony featuring pool and courtyard views, 2nd and 3rd floor. (DL) Carlyle Deluxe - similar room to (PR) but has window instead of balcony, 1st floor rooms have views of pool, 2nd & 3rd floor rooms with garden views.